Spoiled by Sneakers | Run, Lindsay, Run! I have been spoiled when it comes to running shoes. At Villanova, we were sponsored by Nike and received free shoes year-round. While I may have whined and groaned switching from my beloved Mizunos and Asics I trained with throughout High School, free running sneakers are pretty darn sweet. I was more than happy to don Nikes. I wore a pair late August through December, January thru April, and April thru August….rotating every 4 months, marking 3 “seasons”- Cross Country, Track, Summer. It was like clockwork, I never had to remember when to rotate my shoes…they just appeared one day at practice like Christmas presents from Running Santa. I was also lucky to have done an internship the summer before my Senior year of college at ‘mktg‘ in NYC, which handles marketing for Nike. We helped with the running group RUNNYC that meets at Nike Town and NY Running Company, the mobile running van, sponsored the NYC Half-Marathon (when it was Nike-sponsored & held in the late summer), and coordinated the Nike Human Race. There were a lot of test shoes at all of these events and races, and guess who helped clear out the closets and storage of ‘old’, barely worn’ shoes? Certainly I had to save all those size 8 Vomero and Pegasus sneakers from being donated or tossed. And thus, 1.5 years out of college I have finally purchased my first pair of running sneakers since I was 18. But, the cloud cushiony Vomeros I love are $125-$130!! So, being the frugal shopper I am (aka just straight cheap), I turned to eBay. 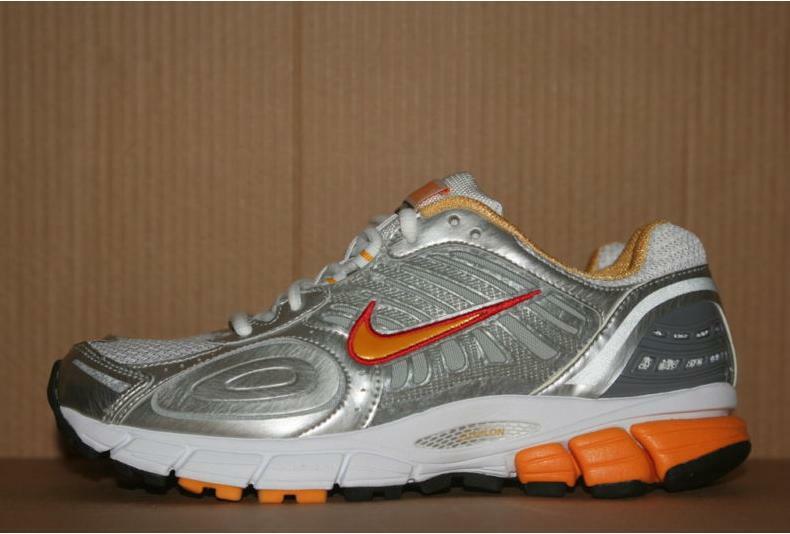 And this weekend, arrived a BRAND NEW pair of sunshine orange Vomeros, for only $50! I admit, I forget when I first started using my old pair. But, they’ve withstood most of Marathon training and 50-60+weeks. The ‘rule of thumb’ is to replace your shoes every 300-500 miles, but I’d go through shoes way way too quickly if I did that! I will try to keep better track of shoe cycles on my training logs moving forward, now that I have to grow up and accept responsibility of my shoe purchasing. Womp womp. What’s your favorite brand and model of running sneakers? How often do you swap for a new pair– by time, or by # of miles run? So glad I stumbled upon your blog! Can’t wait to explore it more. By the way, are you watching that Syracuse game today?? To answer your question…I have discovered that I love barefoot running. Impossible in the snowy state of NY right now, but looking forward to getting back at that minimalist outlet for stress as soon as the grass is green. For now, just happy to don my basic running shoes and hit the paved roads. P.S. You have a great phrase… SnoW excuses!